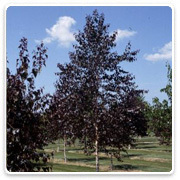 The River Birch tree, Betula Nigra, is a very handsome tree for estates, parks, golf courses and any other large areas. It displays a light reddish brown cinnamon bark that peels and flakes to give that beautiful look that the birch family is noted for. Plant as a specimen, or as a windbreak, plant 20’ apart in the row. It is excellent in wet soil. 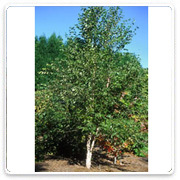 The Whitespire Birch, Betula populifolia ‘Whitespire’, is an Ed Hasselkus from the University of Wisconsin-Madison introduction with chalk-white bark that does not exfoliate. It is a deciduous tree with a strong central leader and has a distinctive and refined pyramidal form. 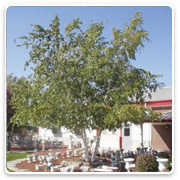 It is considered more heat tolerant than other white-barked birches; therefore, it is often recommended for planting further south than most other white-barked birch trees. 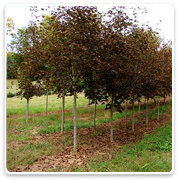 It is tolerant of most soil conditions and considered to be resistant to bronze birch borer. Beautiful glossy deep burgundy red leaf color and cinnamon to white exfoliating bark puts this Birch tree in a class of it's own. The desirable leaf color holds very well through out the summer. Fall is a festival of colors ranging from bright red, orange,yellow and purple. Truly a spectacular all season tree. The Amur Maple Tree grows in zones 3-8. Amur Maple Habit - The tree is deciduous, it loses it's leaves every year in the fall then grows new leaves in the spring. Growth Rate is slow. Site Requirements: requires sun to light shade. Range of soil types; tolerates wind, dry soil and drought. 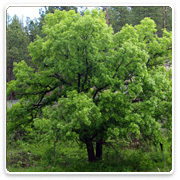 The Amur maple is considered a Medium texture tree. Form - Rounded crown; often multi-stemmed. Height 15 to 20', Width 15' to 28'. Regular maple trees can only give you brilliant color in warm climates, or in certain kinds of soils. 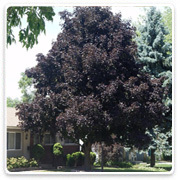 Crimson King Maples are known for their striking, rich purple foliage in colder climates… being one of the few trees to give you excellent color in the northern states. 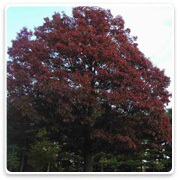 It doesn't matter what soil you plant your trees in... your Crimson King Maples will give you beautiful color anywhere. Korean maple grows in mixed forests on well-drained, stony soils where it can attain a mature height of 15-25 feet with greater width. The species is an openly branched tree with gray, black striped branches. 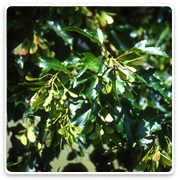 The oppositely arrange, doubly serrated leaves emerge with a reddish tinge that turns to a dark green above with a slight white pubescence on the undersides. The leaves, 4-6" in width, are borne on 1-2 inch petioles and generally possess 9-11 lobes. Fall leaf colors have been described as brilliant yellow, orange and/or red color combinations. The withered leaves are retained through the winter, falling off as growth commences in the spring. 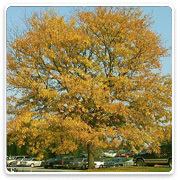 Fall Fiesta® Sugar Maple is a full tree with symetrical branching. Deep green glossy leaves give way to the most brilliant reds and oranges of any of the Sugar Maples in the fall. The October Glory Red Maple tree, Acer rubrum 'October Glory', is one of the best and most popular of the Red Maple cultivars. 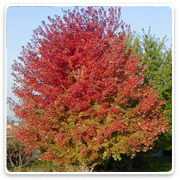 October Glory Red Maple trees are excellent for intense fall color and have a medium to fast growth rate. In the spring, red flowers in dense clusters form before the leaves. 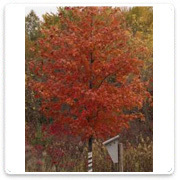 This Red Maple is an excellent tree for lawn or street planting. The Royal Red maple is near the October Glory red maple, two vastly different trees. 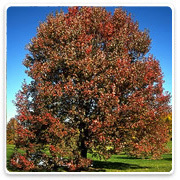 The Royal Red maple is not an acer rubrum-- "red maple"; this tree was created from Norway maple and sugar maple parents. The only reason it's called "red maple" is because of the summer leaf color. 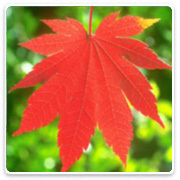 Paradoxically, the October Glory red maple is an acer rubrum -- "red maple," with green leaves in summer. Bur Oak (Quercus macrocarpa) in the white family of Oaks. Maybe when the Bur Oak is in full leaf, it is just a very large tree, but in the winter, when the structure and the almost knurled twisting of the branches of the tree are much more evident, the Bur Oak is a show stopper. It has character. Northern Red Oak, Common red oak, Eastern red oak, Mountain red oak, Gray oak - Northern distinguishes the species from the Southern red oak, which is also known as Spanish oak (Q. falcata); red refers to the leaf and twig coloration; oak is from the Old English ac, which is thought to derive from the Greek aigilops, a type of oak growing in Turkey.